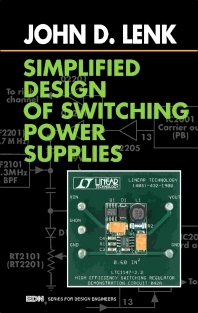 Simplified Design of Switching Power Supplies is an all-inclusive, one-stop guide to switching power-supply design. Step-by-step instructions and diagrams render this book essential for the student and the experimenter, as well as the design professional. Simplified Design of Switching Power Supplies concentrates on the use of IC regulators. All popular forms of switching supplies, including DC-DC converters, inverters, buck, boost, buck-boost, pulse frequency modulation, pulse width modulation, current-mode control and pulse skipping, are described in detail. The design examples may be put to immediate use or may be modified to meet a specific design goal. As an instructional text for those unfamiliar with switching supplies, or as a reference for those in need of a refresher, this unique book is essential for those involved in switching power-supply design. Switching power-supply basics; Heat sinks for switching power-supplies; Inductors/transformers for switching power-supplies; Testing and troubleshooting; Simplified design approaches.